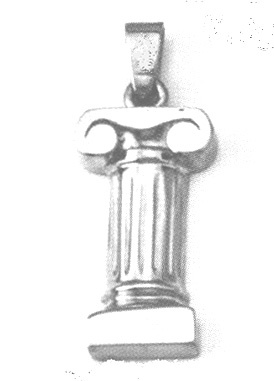 A high quality sterling silver pendant inspired by the Ionian style Greek columns. The body of the pendant is 7/8" high and almost 1/2" wide. together with the bail it is 1 1/4" tall and weights 6 grams. Extra Special offer: Free Shipping & Handling. A two-ply high quality polishing cloth that cleans, shines and protects Sterling Silver, 14k & 18k Gold, and Platinum. The deep-blue exterior cloth is made from 100% soft cotton flannel, folded and sewn. The white interior cloth is thoroughly treated with the finest cleaning and polishing agents and tarnish inhibitors to remove tarnish and polish your jewelry to it's original mirror-like brilliant finish. Each ply measures a extra large 12 x 15 open (12 x 8 folded), and is useable on all sides.Free Shipping & Handling if you buy five or more Jewelry Polishing Cloths.